There are many industrial materials involved in production of carpets, which suggest variety of decisions for picking the right carpet or rug for your living spaces. But… What is the most important one? It is the one that impacts your health and indoor air quality. So, the decision to buy a carpet or rug that has zero or low VOC emission must come first. Join us and find what are the right materials, backings, and pads for your next floor covering. 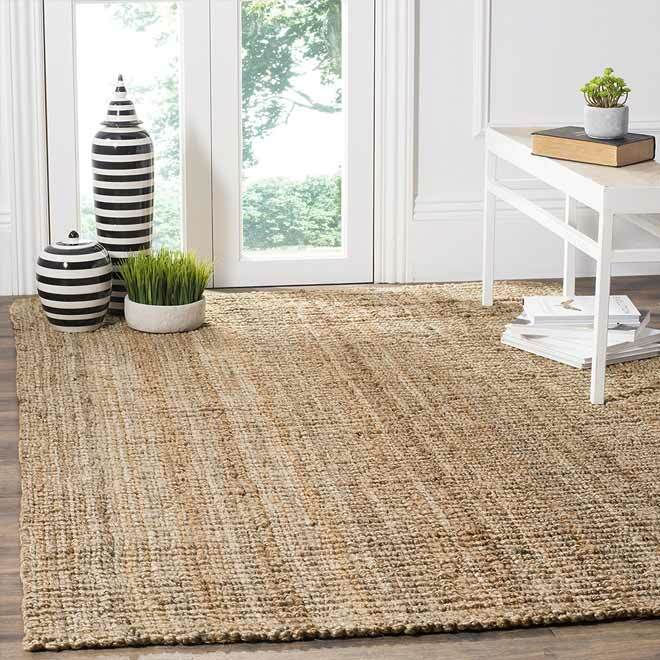 Safavieh are renowned crafters of high quality rugs, so 9’x12’ basket weave from their natural fiber collection is a good sisal choice. 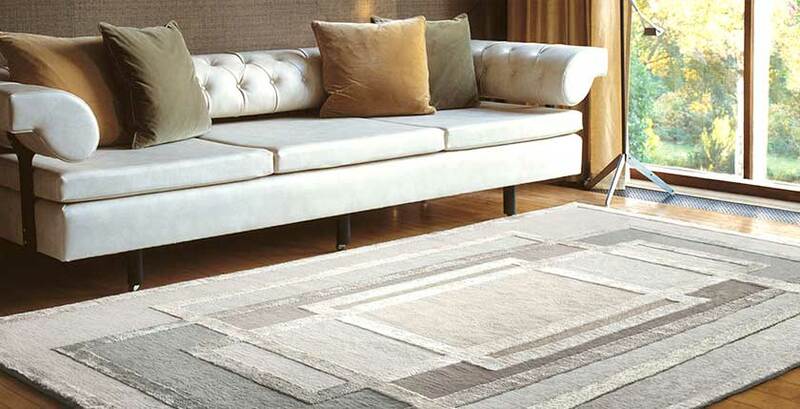 The neutral marble color paired with a fringeless border makes the style casual and contemporary. 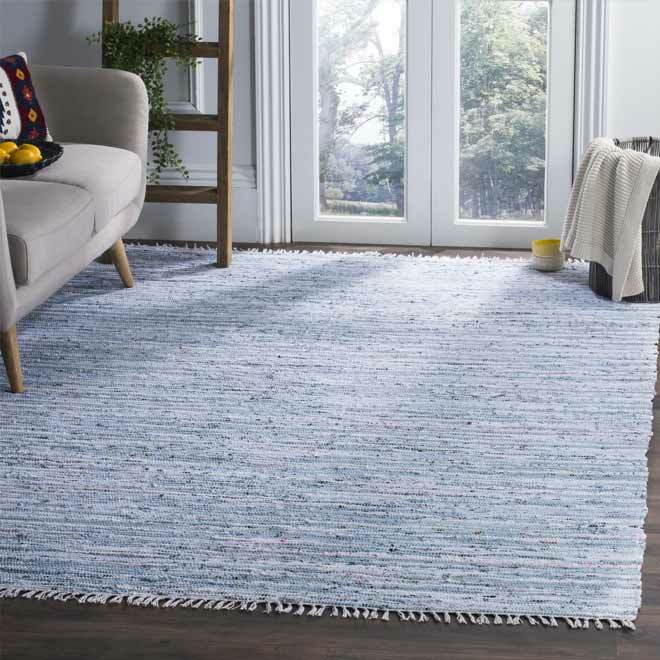 Weighing about 64 pounds, the rug has matching body and border tones giving it the organic appeal with a modern look. Owing to the fiber, the rug is stain- and wear-resistant. The rubber backing is sewn onto the back, making it also slip-resistant and eco-friendly. While it is more on the expensive side, the sisal fiber and lack of adhesive backing makes it arguably worth the money. 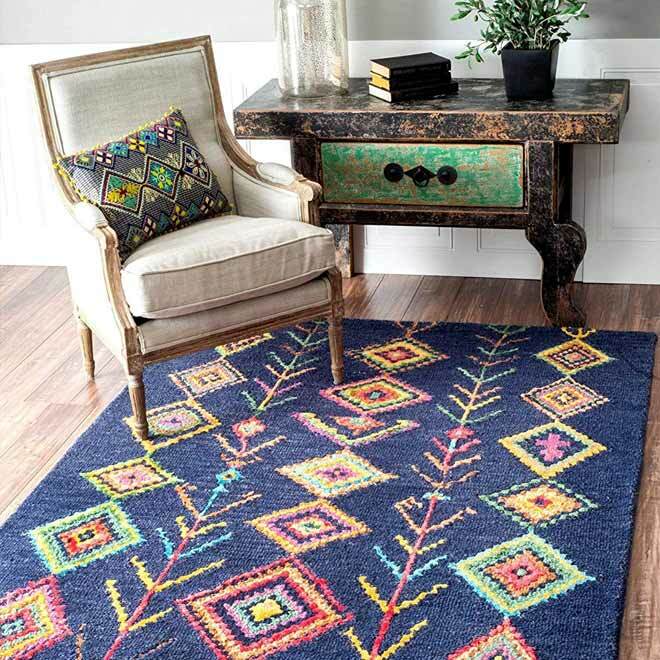 While this area rug is only 90% wool and 10% viscose, it’s an ode to traditional Moroccan navy wool rugs. It is relatively cheaper and will brighten up any hallway or floor. It does not come with any adhesive pads to prevent sliding, which means you will have to buy your own low-VOC rug pads. It weighs 15 lbs with about 0.45 inches of thickness. 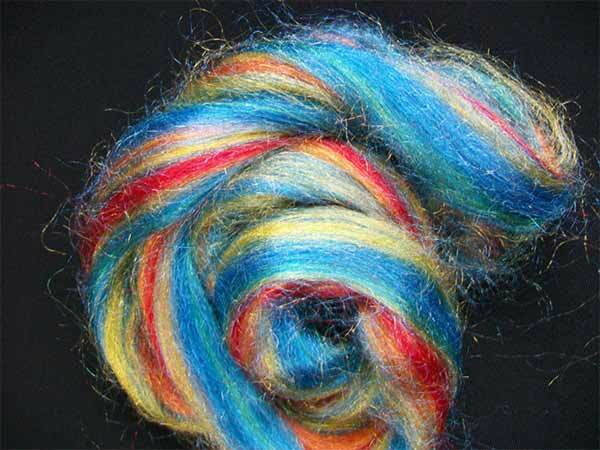 Because wool is less durable, it requires some vacuum to shed out excess fiber. Overall, it is non-toxic and stylish. While rugs are partial floor coverings, carpets are usually tacked down to the floor and cover it wall to wall. This means that a lot of adhesive and padding is needed to install the carpet. Unfortunately, this also means that the carpets become reservoirs of VOCs as well as allergens, bacteria, dust and mites. Having eco-friendly carpets with low VOC mitigates health risk as well as enables better comfort. Choosing or installing eco-friendly carpets begins with checking for a low-emissions label indicated by a small greenhouse icon. This icon means the carpet has been tested by the Carpet and Rug Institute’s (CRI) Indoor Air Quality testing program. 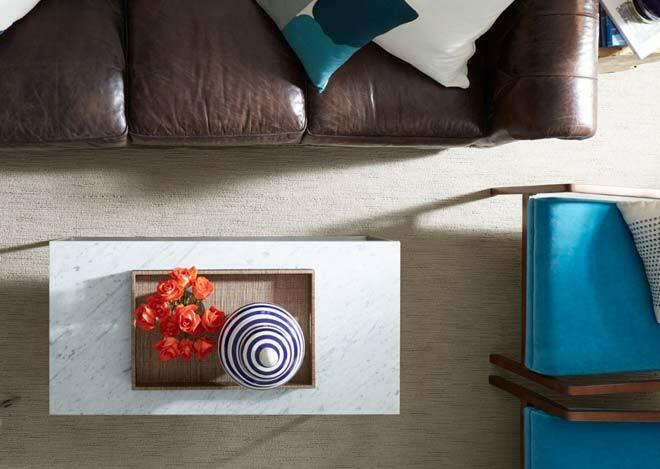 One of the first carpet companies to incorporate only 100% natural materials, Earthweave fulfills its claims of eco-friendly, natural, and low-emission carpets made from organically dyed yarn that is moth-proof, stain-proof, durable and mold-resistant. Giving nylon a run for its money, Mohawk’s SmartStrand scientifically enhances the core component of a carpet – the fiber. It is essentially an eco-friendly version of nylon. The worry-free low VOC carpet from Mohawk allows permanent stain resistance and long-lasting durability. There are mainly two types: SmartSrand Silk Forever Clean and SmartStrand Silk Reserve. “Silk Forever Clean” is packed with 700 silk-like fibers while “Silk Reserve” is made for maximum durability. The fibers are OEKO-TEX Standard 100 certified free of harmful substances and has a pet protection warranty. With no dye sites, the carpet will never lose stain protection. It is also engineered with a deep foam cushion. Scientifically, these carpets are the future of all easy-to-clean, eco-friendly and low-VOC flooring. In the synthetic department leading brands are Mohawk, ShawFloors and Earthweave. Natural carpet with wool face, cotton backing, and natural adhesive. Apart from material, look for low-toxic adhesive binding to the secondary backing. An example of secondary backing can be a primary backing of hemp & cotton, followed by a natural rubber adhesive backed by a secondary jute backing. This maintains a low VOC carpeting process without the need for spending too much on expensive synthetic fiber carpets. It is also important to air the carpet before installation; this can be as easy as a pre-delivery request to the carpet distributor. It also pays off to look for non-toxic carpet and rug padding like felt, cord or wool. Styrene-butadiene rubber is what one must surely avoid as some even have the same toxicity as formaldehyde. Alternatively, there are various chemical-free, low-emitting and non-solvent adhesives in the market. Choosing a resource efficient carpet is especially important given the huge amount of carpeting used in the world, and its relatively short expected useful lifetime. The Carpet Recycling Committee says that 1.8 million tons of rugs and carpets are sent to landfills each year. 1.8 million tons of rugs and carpets are sent to landfills each year. Major carpet manufacturers are reacting to increasing landfill costs and regulations and are now seeing a market advantage to improving the environmental impacts of their operations. These improvements have ranged from refurbishing used carpet to making new products from old carpet and carpet scraps, such as carpet fiber, carpet backing, soil amendments, auto parts and flooring materials. Companies that traditionally use nylon face fiber are now offering carpet with either post-industrial or a combination of post-industrial and post-consumer content. Some of these companies are also offering backing made from 100% reclaimed carpet. Almost all used carpet can be recycled into new products, although recycling PET carpet is not common yet. 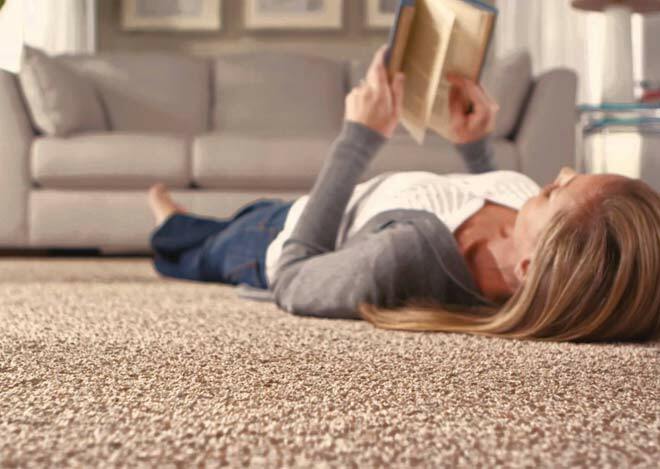 Reclaiming face fibers is difficult; most lines of carpet have one-of-a-kind formulations and identifying the components of used carpet is not easy. In addition, carpet is often contaminated and hard to collect and process. Even with these barriers, carpet is being reclaimed through carpet reuse, chemical recycling and mechanical recycling. The vast amount of carpet manufactured and installed in the US is made of synthetic materials – nylon 6, nylon 6.6, polyester, and polypropylene (PP) face fibers with most backings being a sandwich of polypropylene fabric and latex, or poly-vinyl. Most of the commercial carpets are made by bonding a face fiber to a backing fiber, using one of a variety of strong bonding agents. Nylon 6 and nylon 6.6 account for nearly two-thirds of the face fiber market, with PP being the next most commonly used fiber. Nylon 6.6 has a higher performance rating than nylon 6 but it may not be enough to make a difference in selection. Recycled content and recyclable carpet options each has its own merits and considerations, depending on your specific need, location, and use. Nylon, polyester, and plastics are made from petroleum, a nonrenewable resource. Since the face fiber backing can contribute up to 60% of the carpet material, purchasing a nylon face fiber with 100% recycled content backing is worth consideration. Or 100% recycled PET polyester. Most of the recycled nylon comes from post-industrial fiber (waste from extrusion and yarn mills, clean lint and edge trim from finishing lines) as opposed to post-consumer (carpet that has served its useful life). The technology is rapidly advancing (ie., DuPont and Shaw) to separate and convert used nylon fiber into new carpet fiber and backing, making a closed-loop system. Several companies make carpet cushion materials that utilize recycled and natural materials such as recycled post-industrial fibers, recycled polyurethane, and jute and hair. Recycled tire rubber and recycled textiles and foam are made into carpet pads. The density and durability of the fiber for heavy traffic use, and how color and pattern contributes to wear. Some people prefer the appearance and durability of nylon over polyester, others will state that recycled polyester (PET plastic) is more durable and naturally stain resistant. Wool carpet is naturally flame resistant, durable, and provides excellent indoor environmental quality. Floor coverings other than carpet make good environmental choices. Purchasing new carpet means you have to get rid of the old and keep it out of the landfill. Ensuring that your old carpet is recycled and made into new products is very important. Although recycled PET carpet uses plastic that otherwise might be destined for the landfill, once the carpet serves its useful life, it is presently very difficult to recycle the carpet. Find a company that will keep your old carpet out of the landfill. Chemical recycling involves breaking down the nylon itself to be reprocessed into new carpet fiber. Only certain kinds of virgin nylon compounds can be converted into new fibers. Check with manufacturers to see if your particular existing carpet brand and style is eligible. Waste to Energy. Products that cannot be converted into new carpet can be converted into fuel pellets for some applications. Fiberizing. 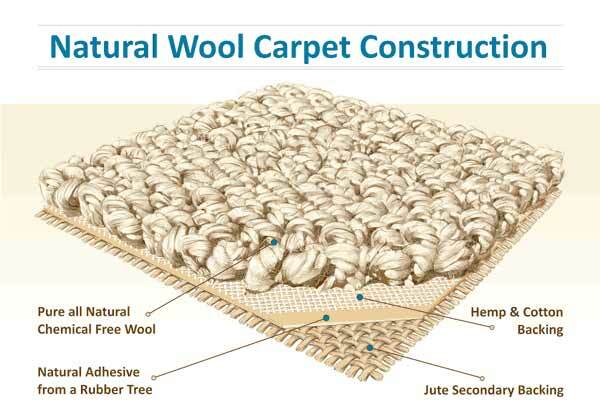 Carpet fibers can be harvested and converted into padding and matting for use in laying new carpet. Mechanical. Carpet fibers can be separated from their backing material. If possible, the fibers are recycled into new carpet or backing. The leftover materials can be processed into products such as parking barriers, geotextiles, lumber alternatives, fiberboard, sod reinforcement, carpet tack strip or automobile parts, among other products. Natural linoleum is a natural building material, made from softwood powder, linseed oil, pine tree resins, cork, chalk, and jute backing. Recycled-content tile is available made from waste glass such as light bulbs and auto windshields. Recycled-content tile is also made from a byproduct of feldspar mining. Linoleum and natural carpets use renewable resources and offer durability without compromising aesthetics. The cork used in linoleum is harvested from the cork tree on an ongoing basis without harming the tree. 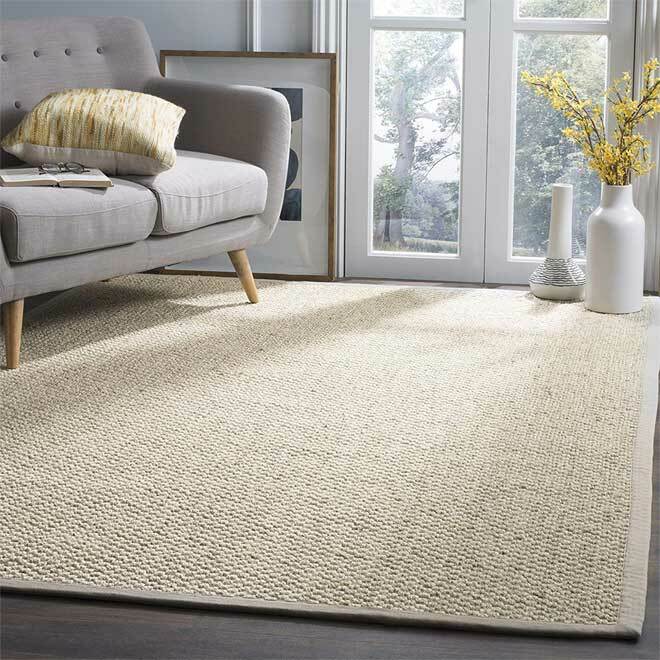 Natural carpets are made from grasses, cotton, and wool, with minimal treatment. Ceramic tile offers outstanding durability and maintainability, with a high aesthetic value. Recycled-content padding and carpeting are priced competitively. Recycled-content tile is higher priced than average tile products. The least toxic adhesives used with ceramic and recycled tile are locally available at competitive costs. Linoleum will cost more than low cost vinyl flooring. Natural carpet materials are more costly than common carpet materials, but competitively priced with standard high quality carpeting. Polyester carpet fiber is produced from recycled PET (i.e., soda and ketchup bottles). Some of the names which recycled fibers are marketed under include Resistron ISF, Resistron and Permalon. The carpet resists stains, fading and abrasion. PET fibers are naturally stain resistant and do not require the chemical treatments commonly used on nylon carpet. Scotchguard coating increases the stain resistance properties. Fibers retain their color and resist fading due to sun or harsh cleaning. Shades can be richer and brighter than those found in nylon yarns. Because plastic beverage containers are made with top quality PET resins as required by the U.S. Food and Drug Administration, recycled PET is superior to lower grades of virgin synthetic fibers used in making other brands of polyester carpet yarns. PET has exceptional strength and durability and the value of these properties is not lost in their recycling process. Polyester has fewer emissions than nylon because it is made with fewer additives, and because it is inherently stain resistant. Easier maintenance reduces the use of cleaners which also emit VOCs. At this time, there are no programs to recycle used PET carpet back into new carpet, but fibers can be recycled for other applications (car parts, insulation, transportation devices, stuffing for furniture). What does low VOC stand for? Low VOC means a low concentration of volatile organic compounds. VOCs are a group of chemical based on carbon. They evaporate easily at room temperature and disperse into the surrounding air. Most people are able to smell a high level of some VOCs, but for the most part VOCs do not smell at all. Various materials and products can off gas VOCs – glues, paints, varnishes, solvents, wood products, plywood, chipboard, furniture fabrics, carpets, etc. Also volatile organic compounds can evaporate during cooking, dry cleaning, smoking, in the process of using non-electric air heaters, copiers, etc. What is considered low VOC content? The health risk from breathing VOCs depends on how much they are presented in the air, and how long, and how often you breathe them. Scientists distinguish two types of duration of exposure to VOCs: short-term – several hours or days – and long-term (chronic) – years or even a lifetime. Inhaling of a small amount of VOCs for a long time may increase the risk of health problems. Some studies argue that VOCs have a negative impact on people with asthma, or people particularly sensitive to chemical compounds. For low VOC carpet the CRI standard defines 0.5 milligrams per meter square over 24 hours and 14 days period. Which carpet is best for allergies? 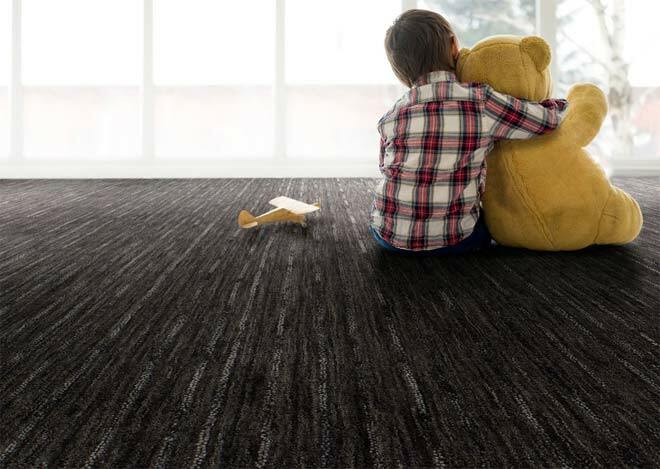 Research by the German Allergy and Asthma Association DAAB eV show that the use of a carpet can significantly reduce the risk of increased particulate matter in indoor areas, in contrast to a smooth floor covering. The high dust-binding capabilities of carpet ensures that dust doesn’t swirl as easily through the air as it does on smooth surfaces. Carpets binds the fine dust that contains the allergenic mite feces, until the next time you vacuum. Thus they cannot be inhaled, which is why textile floor coverings are particularly suitable for allergy sufferers. While the particulate matter content in rooms with hard floors is more than 40 micrograms per square meter, in rooms with carpet it is only 10 or less micrograms per square meter. But what is a good brand/type/fiber? Generally, look for medium pile, possibly tightly woven, low VOC carpet. It is easier to maintain than carpets with long strands . Just remember to vacuum regularly and use a HEPA filter when doing so. Which carpet has the lowest VOC? Natural fiber carpet with natural pads and backings, with no synthetic dye used. Also, a no VOC adhesive must be used when installing. Is nylon carpet better for allergies? There is no evidence that synthetic materials, like Nylon, are better for allergies then the natural ones, like wool or jute. There is actually a counter argument, that wool has more hypoallergenic properties that other fibers. Is there formaldehyde in carpets?